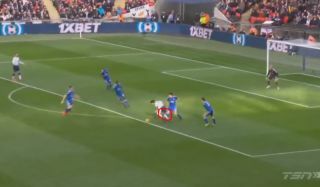 Tottenham star Son Heung-min looked unlucky not to get a penalty against Leicester City this afternoon after being brought down by Harry Maguire. The South Korea international quite clearly looks to be tripped by Maguire in the video of the incident below, but got a yellow card for diving instead. In fairness, maybe Son didn’t help himself by making the most of the challenge, though Maguire’s reaction might also have swayed referee Michael Oliver.